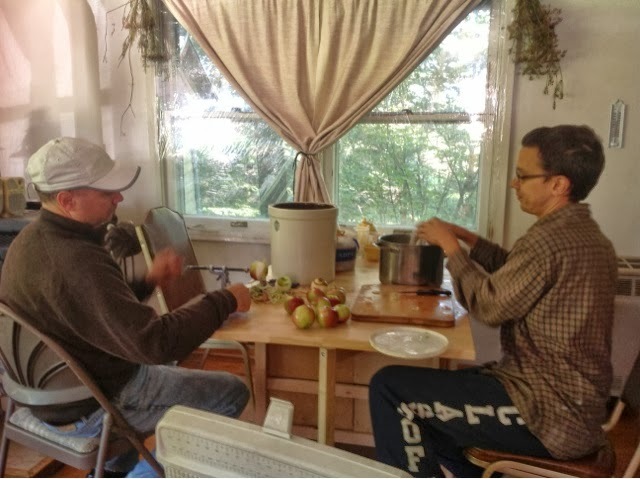 Toward Permasteading: "Fall is the most wonderful time of the year"
"Fall is the most wonderful time of the year"
Neal's uncle cliff visited over the fall equinox. 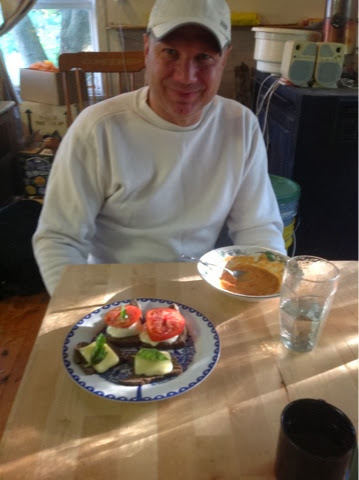 Here we were particularly impressed with his opened faced grilled cheese sandwiches. 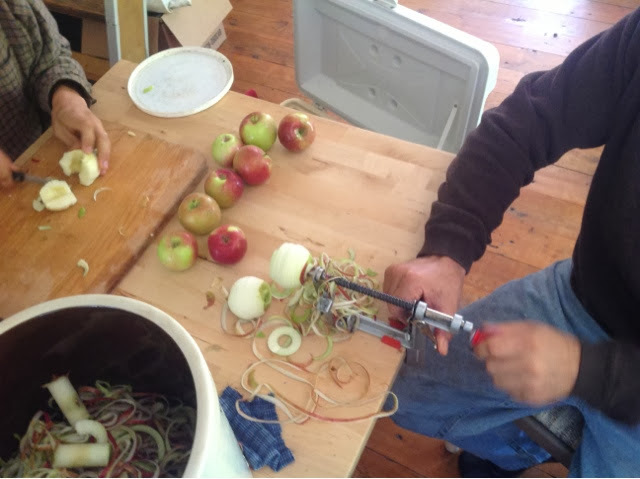 We got 30 lbs of "damaged" apples from an orchard 25 minutes away for just $7.50, and Cliff helped us process them into applesauce. We love this tool for coring, peeling, and slicing all at once. Recently, we have been experimenting with ferments. 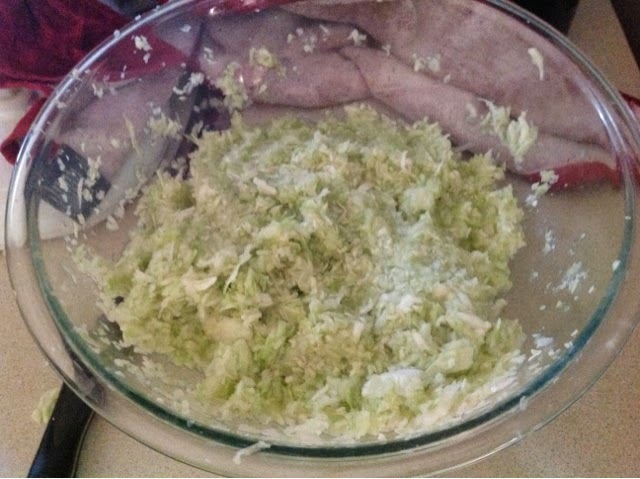 This is a typical saurkraut here. We also made sour beets with burdock root. These are traditional style cucumber pickles (the type people would have eaten before canned dill pickles were invented). 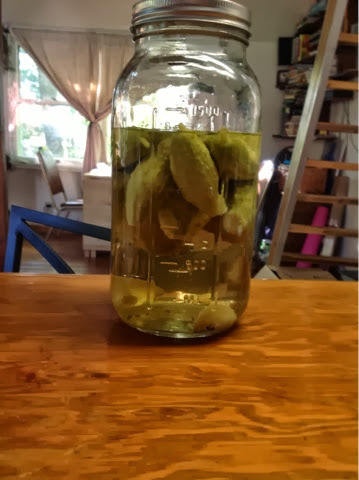 The little cukes sat in a salt water brine for a few weeks and naturally fermented on their own. 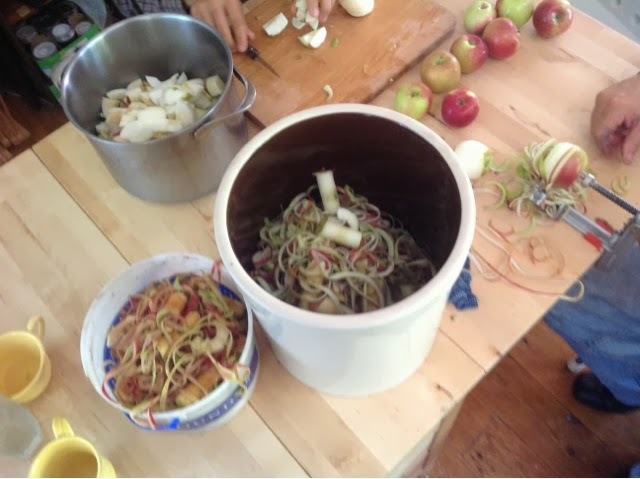 We like the book "Wild Fermentation" by Sandor Katz for ferment recipes. Apparently other people love it to because there were 15 holds on the library copies we wanted to check out. We opted just to buy the book online since it was apparently so awesome. Catherine graciously shared her Concord grapes with us and we used them to make juice. There was originally talk of canning some of the juice for later, but we drank it all before that happened. Hehe. 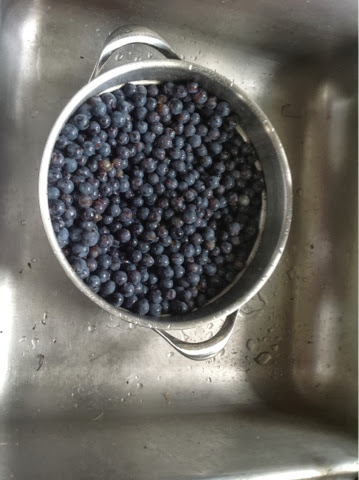 We also made a wild grape juice to share with folks at Casa. It was so intense and sour that it required dilution and sweetening to be palatable to most folks. There will probably be lots more pictures of our fall harvesting and preservations in the coming weeks, but I'm thinking the posting will be more sporadic. Hang in there.